Lenovo's ThinkPad X1 Carbon Ultrabook is back, and its design has largely reverted back to a business-classic status that should please long-time fans of the brand. Primarily, the Adaptive keys that left us scratching our heads a little on the last model are gone, with real F-keys now adorning the top row of the keyboard. Furthermore, the Caps Lock key, which disappeared in favour of double-tapping the Shift key on the 2014 model, is now back on this 2015 model. On the inside, the X1 Carbon now moves to a 5th generation Intel Core i5 CPU, and a slightly bigger battery capacity has been installed. It's a 14in laptop that looks and feels as sleek as ever, with a tapered design and essential ports along the sides, and it's also a lightweight; it tipped our digital scales at 1.32kg. Along with a thickness of about 19mm, it's as easy as you like to carry around to meetings and to and from work (even if you rely on public transport for your daily commute). The build quality feels strong enough, and the main moving parts (the hinges and the keys and touchpad) are all solid. Along the edges you get two USB 3.0 ports (one on each side), there is a full-sized HDMI port, a Mini DisplayPort, a headset port, and a port for the supplied Ethernet dongle. The rear has a SIM tray that can be used with the optional 3G or LTE mobile broadband modules. Next to the keyboard is a fingerprint reader. Unfortunately, an SD card (neither full-sized nor micro) is included. The right side has USB 3.0, the port for the Ethernet dongle, and the air vent (there is a small fan installed that doesn't make too much noise, and the base doesn't get warm enough to be uncomfortable while resting the notebook in your lap). On the left you can see the power port (which can quick-charge the battery in about an hour), HDMI, Mini DisplayPort, USB 3.0, and a headset port. On the rear you can see the SIM tray. We looked at the entry-level model ThinkPad X1 Carbon (20BS-003AAU) for this review, which is a model that features an Intel Core i5-5200U (15W) CPU, 4GB of RAM, and a 128GB solid state drive (SSD). It's a configuration that won't set the world alight, but it's fine for getting through general office duties, creating and viewing presentations, and online communications. If you want more power, you can get a Core i7 model that features 8GB of RAM. Our Blender 3D rendering test recorded a time of 46sec, which is the exact same time that was achieved on the 2014 ThinkPad X1 Carbon that we reviewed (that one had a 4th generation Core i5-4300U). In 3DMark's Cloud gate test, a mark of 4720 was achieved, which is similar to the 4536 that was recorded by the 2014 model. It was in the storage performance that we saw a major difference between the models, with CrystalDiskMark returning a sequential read speed of 528.8 megabytes per second (MBps), and a write speed of 485.5MBps. On the 2014 model, the SSD was a disappointment, getting 417.4MBps for reading, and only 170MBps for writing. In our battery rundown test, in which we disable power management, enable Wi-Fi, maximise screen brightness and loop a Full HD, MP4 video, the 2015 X1 Carbon's 50 Watt-hour battery lasted 5hr 33min. This is a decent time for a thin, 14in laptop, and almost an hour more than what the 2014 model returned in the same test (though that model had a 45 Watt-hour battery, more RAM, a 1440p screen, and Windows 8.1, so it's not a direct comparison). Note: our ThinkPad X1 Carbon was preinstalled with Windows 7 Pro (64-bit), which is given as a right to downgrade in Windows 8.1 Pro (64-bit). At this point, we'll mention that the bottom panel is removable in case servicing is required. This means that the battery and a few key internal components can be replaced. There is an M.2 (Next Generation Form Factor) slot accessible for the SSD, as well as a slot that's occupied by the Wi-Fi module (an Intel Wireless-AC 7260 capable of 802.11ac performance) and an empty slot for the mobile broadband module (the antennas and SIM slot are in place for it). Memory can't be upgraded due to it being soldered directly onto the motherboard, so you have to make sure that you purchase the model with the memory capacity you require (the maximum is 8GB). For more storage, and also for faster storage, Lenovo offers up to a 512GB M.2 solid state drive with a PCIe x4 interface. This PCIe-based SSD can provide double the performance of the SATA III SSD that's in the stock configuration we've looked at here. The screen is a simple one; rather than being a glossy, IPS-based (in-plane switching) touch panel with an ultra-high pixel count, it's a Full HD, TN-based (twisted nematic) panel with an anti-glare finish. It has the same hinge design as the 2014 X1 Carbon Ultrabook, meaning you can tilt the screen all the way flat on the desk. However, with TN-based technology rather than IPS, that means the screen contents can become hard to view in that position. We found the brightness of the screen to be high enough for comfortable use in our office environment, and we appreciate how far it can be dimmed for use at night. The matte finish means reflections won't be a problem, and coupled with the high brightness, it's a good model to use if you regularly work in a well-lit environment. We aren't all that enthusiastic about the TN technology, though, which means that you have to adjust the angle every now and then to see things with their proper contrast. If you want to be able to view photos and videos comfortably, you're better off going for the 2560x1440-pixel IPS screen. If you're really keen, the model above the entry-level offers an IPS-based, 2560x1440-pixel touchscreen, though it has a slightly lower brightness. It's a return to form for the ThinkPad X1 Carbon after the experimental keyboard that was implemented on the 2014 model. It has to be said that it seemed a peculiar thing for Lenovo to undertake so many changes to last year's X1 Carbon, primarily because of the business market that the ThinkPad targets, and also the loyal following it has due to being part of the ThinkPad family. Once you lift the screen, the clean design and logical layout of the keys is refreshing. The F-keys are back in a physical form, the Caps Lock key is back, and other little adjustments have been made, too. The Backspace and Delete keys are no longer next to each other, and the tilde key is back in its rightful position at the top-left of the board, which paved the way for the return of the dedicated Print Screen key. Back to normal: the Function keys are back, Caps Lock is back, and other changes have been made to the layout of the keyboard and the feel of the touchpad. 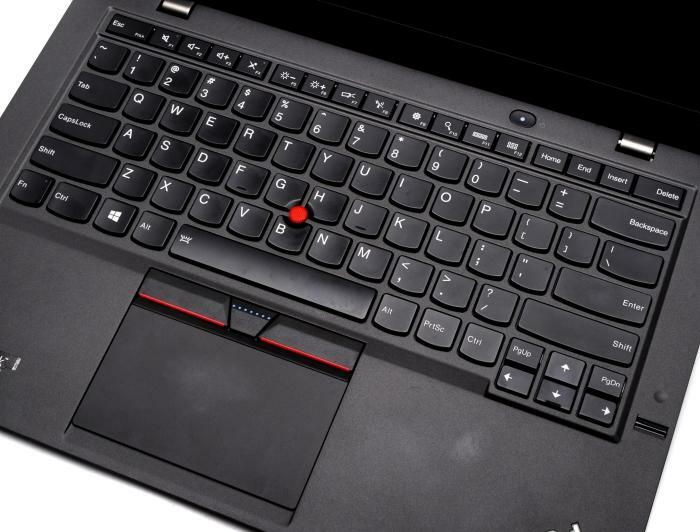 The keyboard has ThinkPad's characteristically solid feel, with curved keys that are well spaced and full-sized. They are easy to hit and they are almost silent in their operation. The keys feel soft, yet have a firmness that's undeniable, and even though they feel quite shallow, we think there is enough travel present to get used to them after a few short typing sessions. It's a tough model to overlook if you're a typist looking for an Ultrabook, because the keyboard really is that good. Furthermore, the 14in size of the laptop means there is plenty of space for resting your palms and getting comfortable. A smooth, white backlight can be switched on in two intensities to facilitate typing at night. On the previous model, dynamic icons replaced the Function keys across the top of the keyboard. The real Function keys are back now, and they are set up so that you can perform system settings changes as their primary function; that is, you can change brightness, volume, and do things such as toggle Wi-Fi at the press of a button. If you actually need to use the F-numbers, then you need to hit them in conjunction with the Fn key in the lower-left corner. This can't be changed in the BIOS if you want things to work in the other way, but you can use the Function Lock feature instead. The position of the Fn and Control keys can be switched around in the BIOS. That said, we love having the Fn key in the absolute corner because it makes it easier to switch on the keyboard backlight at night (you can just feel for the Fn key and then hit the Spacebar at the same time). Two control methods for the pointer are present, including a large touchpad (100x66mm), and a TrackPoint. The touchpad is different to the 2014 model in that the whole pad doesn't feel like a giant button, with only the left- and right-click buttons being clickable areas. It offers more precise control this way. Likewise, the virtual buttons that were used for the TrackPoint are now gone, and physical buttons are back in their place. We didn't experience any major problems with the touchpad during our tests, though we did get annoyed by the implementation of the three-finger swipe gesture, which is set to go back by swiping right, and forward by swiping left. That felt unintuitive to us since we are used to swiping left to go back, and we couldn't find a way to change it in the Synaptics driver settings. While the 2014 version of the ThinkPad X1 Carbon left us a little perplexed due to the changes that were made to its keyboard, this 2015 version has left us satisfied. While it's a product that didn't immediately stir up any emotions, we did get excited once we realised that the keyboard is once again 'normal'. That, coupled with the sturdy build quality and slim design make the ThinkPad X1 Carbon a good laptop for executives, typists, and anyone else who wants great portability and usability.